To say head groundskeeper Bob Christofferson is dedicated to his craft is an understatement. To say he’s attentive to detail undersells how obsessive he is about the field he’s in charge of keeping perfect each and every day. It’s 7:02 p.m.: just minutes until first pitch. A group of tired workers huddle in an office just a few paces away from the freshly mowed grass and manicured dirt of Safeco Field. With ball caps askew, foreheads damp and well-earned sodas in hand, they stare intently at a screen, admiring the day’s work. As pregame festivities come to an end and the last note of the “Star-Spangled Banner” fades, a choir of high-school-aged kids exits stage right. The grounds-crew members are not the only tireless workers who go largely unnoticed. 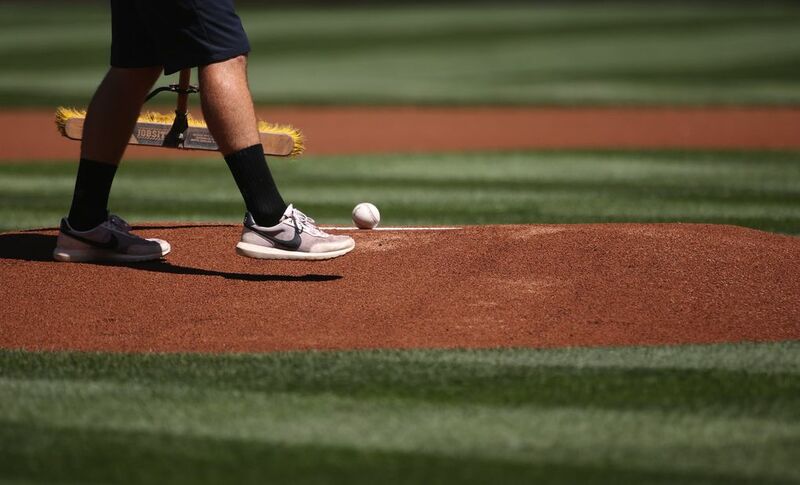 Matt Walcott, the umpire’s equipment manager, has been working with the Mariners since he was 15 and hasn’t missed a home game since he started in 1982. One of Walcott’s tasks is rubbing up baseballs for each game — a process that uses special mud taken from a secret location in Chesapeake Bay to make the balls darker and less slippery. The tradition dates to 1938, nearly two decades after Ray Chapman of the Cleveland Indians became the only major-league player killed by a pitch. The ball got away from pitcher Carl Mays, striking Chapman in the head. 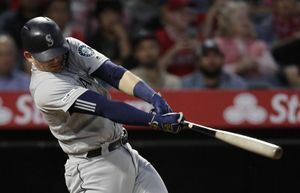 Walcott mixes it with spit and grime to perfect each baseball at Safeco Field. Given the average life of a baseball is between five and nine pitches, he rubs up a lot of baseballs. The voice is that of Bob Christofferson — a man who’s been fixating on details like that for 37 years. It’s his job. To say Christofferson is dedicated to his craft is an understatement. If Safeco is a canvas, Christofferson is Picasso. To say he’s attentive to detail undersells how obsessive he is about the field he’s in charge of keeping perfect each and every day. He’s been doing it for the M’s for 17 years, and before that for 19 years with the Tacoma Rainiers. 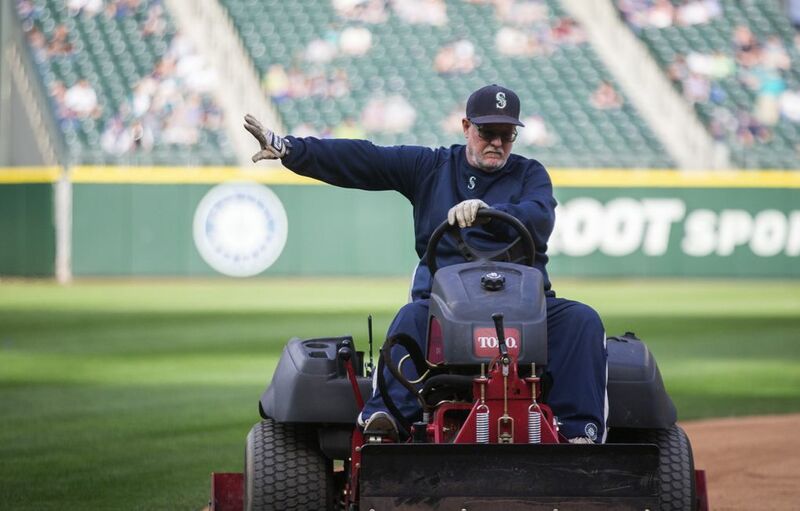 Safeco’s “Sodfather” expects perfection. And the 13 members of his crew — six on the day crew and seven on the night crew — try to give it to him. Being so meticulous translates to results on the field, and everything the grounds crew does is for the players. Take the outfield, for example. You’ll see wide, even stripes running in three directions: one set to left field, one to right and the other to center. The design used to be checkers — an aesthetic Christofferson preferred. But in 2002, then-center fielder and fan favorite Mike Cameron came to Christofferson with an idea: Since hard ground balls wouldn’t stay true with the checkered look, Cameron wanted to create a runway of sorts. Mow the grass in a long straight line, and it’ll be easier to charge, he thought. And if Cameron liked it, why not mow that formation for each outfielder? The crew also accommodates other players. 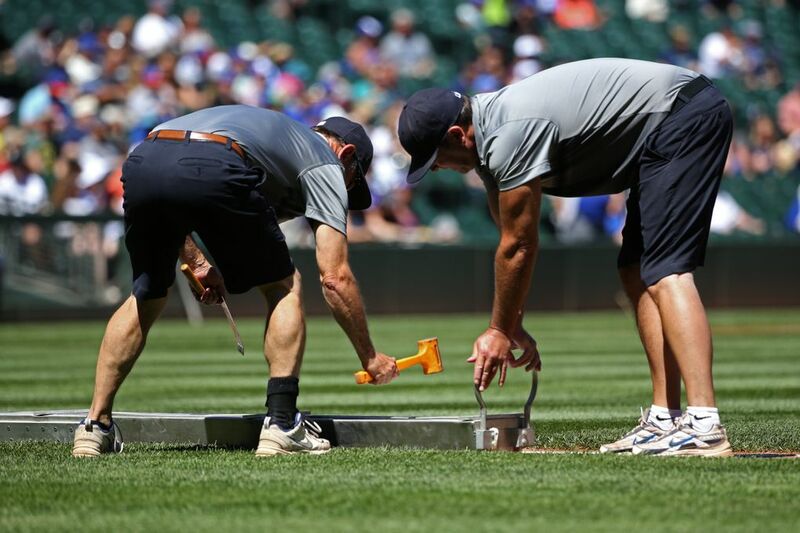 They’ll mold the mound after a game to cater to the preferences of the next day’s starting pitcher. 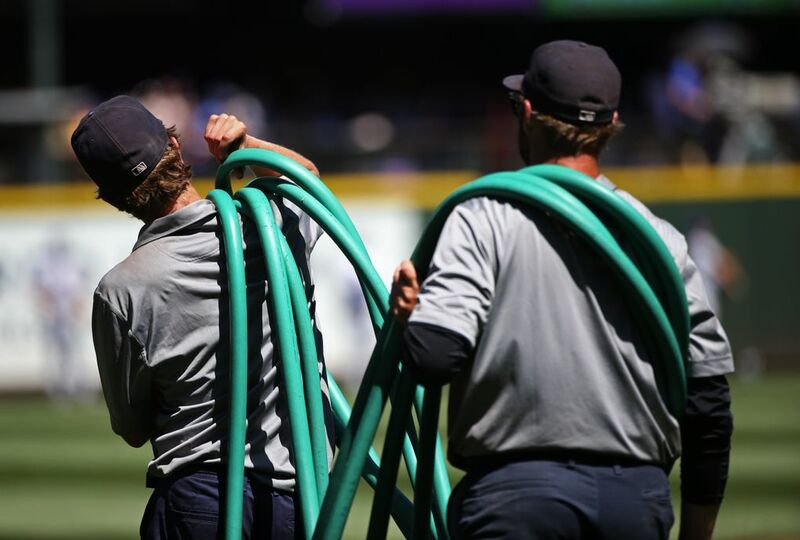 They’ll make sure the infield grass and dirt are well watered on a sunny August day to slow the balls enough for the infielders to charge. Heck, they’ll even pick up little pieces of water balloons after players sling them around the outfield on a particularly toasty afternoon. “We’re here to make their field as good as it can be for them,” Christofferson said. “We’re telling the third baseman and the first baseman all the time which way the ball is going to roll. In a game, I want it so they don’t have to think about it. Christofferson rarely takes his eyes off the field he loves. When he’s not sauntering across the field with a rake or hose in hand, he’s in his office working, planning and watching. Two screens sit in his office, just a few paces from the opposing dugout. During a game, one monitor shows a bird’s-eye view of the field, while the other shows the broadcast. For a guy who essentially lives at the ballpark, Christofferson never watches the games in person. Instead, he sits in his office, monitoring each grounder, collision and dive. He says he has a better vantage point that way, but he’s also worried that he’ll be publicly blamed if the field doesn’t cooperate on a play. An average day begins early and ends late. At 9 a.m., crew members are out touching up the “S” and the Mariners’ logo behind home plate with spray paint and stencils. An hour later, the mowers start humming, whipping around the outfield grass in harmony. Raking the dirt comes next. Then watering. And it doesn’t stop until game time. It’s a process grounds-crew member Carl Guabe calls “turning the field over.” Keeping the dirt firm, but not too hard like concrete. It is a constant pursuit of the perfect consistency. There’s always something that needs touching up — especially on the dirt. 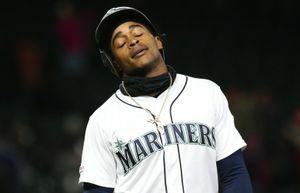 “It’s all equally important, but the dirt is where 90 percent of the action is,” Wilson said. A sheet plastered near the doorway in Christofferson’s office shows an intricate list of tasks along with the day’s itinerary, almost to the minute. Nothing will fall through the cracks under Christofferson’s careful watch. 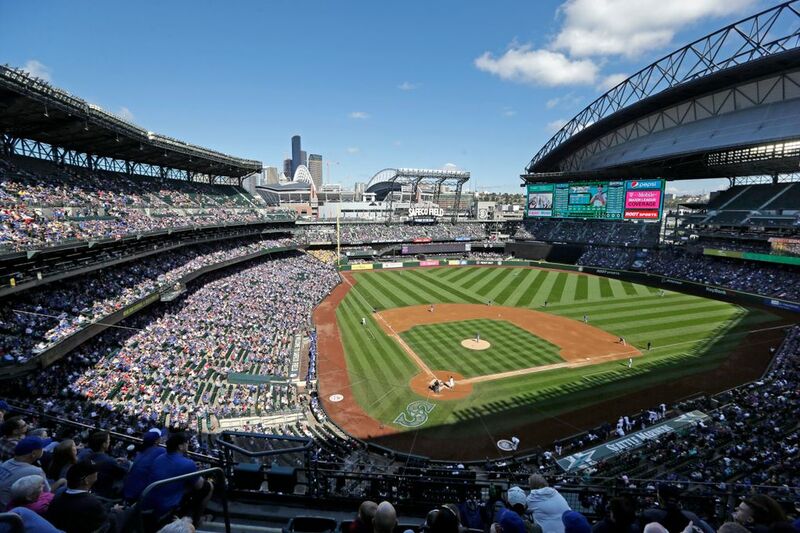 If home is where the heart is, then Safeco Field is Bob Christofferson’s home. 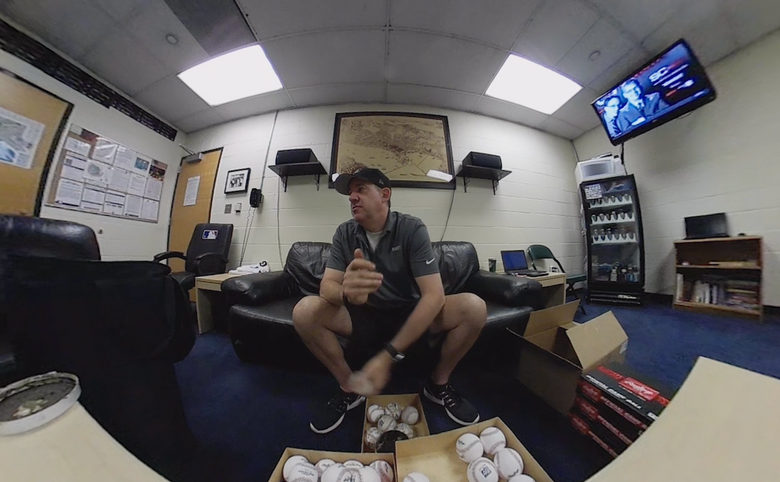 His office — full of Mariners memorabilia, of course — often doubles as a bedroom, particularly if a day game follows a night game. The worn leather couch converts to a bed, but, “Sometimes it’s just easier to lay on the couch,” Christofferson said. And the crew is Christofferson’s family. Groundskeeping and baseball are in Christofferson’s blood. His dad was on the original grounds crew at Cheney Stadium in 1960. 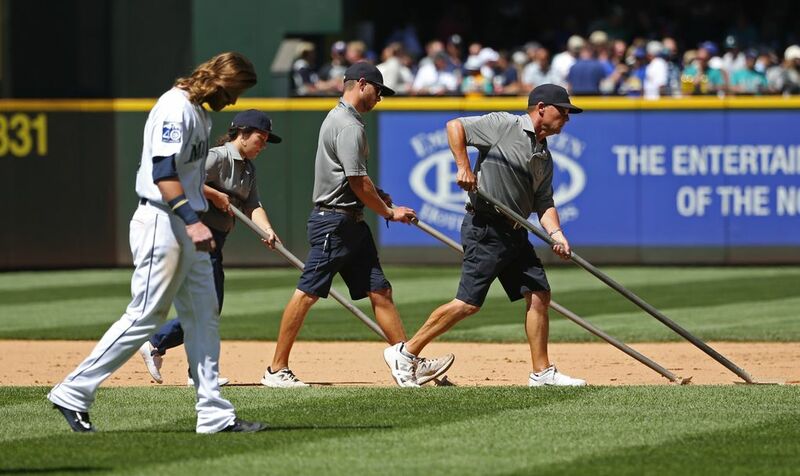 He eventually took over as heads groundskeeper in Tacoma, patrolling the same field he grew up around. And then, he got the call to “The Show” in 2000. It’s been 16 long years without playoff baseball at Safeco Field. Most of the crew members have never experienced preparing a field for a playoff game — something Christofferson and Wilson reminisce about fondly. When the time comes again, someday, they’ll be ready — and you’d better believe Safeco Field will be glimmering. Christofferson and his crew wouldn’t have it any other way. It’s 7:10 now: Time for first pitch. “PLAY BALL!” echoes through the stadium. The last gasp of evening sun drenches the outfield grass as the Mariners, in their bleach-white unis, settle into their positions. After a day on the move,Christofferson leans back in his leather chair, his watchful eyes still observing the field for any blemishes. He’s finally satisfied.